GALION — Northmor’s defense staked them to a strong early lead and the Knights were able to hoheld on Monday to top visiting Mount Gilead 60-51. Neither team could get much going in the first quarter until Zach Parrott connected for three points in the final minute to give Northmor a 9-6 lead. The Knights took that momentum into the second. After Mason Mollohan opened the quarter by drawing a foul and connecting on one of his free throws, the Knights got five straight points by Kyle Kegley and two free throws from Brock Pletcher to open up a 16-7 lead. While the Indians tried to work out of that deficit in the first, Northmor’s Alijah Keen had different plans, scoring 10 points in the quarter, including eight straight for the Knights at one point. Thanks to that effort, the Knights led 29-18 at the break. Kegley hit a three-pointer to open the third quarter, putting the Knights up 32-18. After he scored four more points, Northmor was still up by 14 with 5:12 remaining in the period. However, the Indians battled back. Tyler Bland sparked a 7-2 run by scoring all of his team’s points during that span. Johnson responded with a basket and then, after Jason Bolha connected on one-of-two free throws, the Knights went on a 7-3 run with all their points coming from the charity stripe. Despite the Indians getting five points by Bolha in the final two minutes, Northmor was able to win by nine thanks to the efforts of Johnson, who scored six points in that span, and Tyler Kegley, who connected on three late-game free throws. With the regular season winding down, the two teams have slightly different focuses. For the Indians, Cooper is working to get them ready to make a postseason run. The coach noted that his players need to do a bit better on the boards in order to have success in the playoffs. “Everyone wants to win a championship by themselves, but if we beat Highland, if I had to share with someone, it’d be Cardington,” he said. Of course, for that to happen, the Knights have to top a Scot team that picked up a convincing 21-point win on Northmor’s court. Ruth is hoping some things that worked in Highland’s favor in that mid-January match-up don’t on Thursday. Brock Pletcher works inside for a basket against the Mount Gilead defense on Monday. 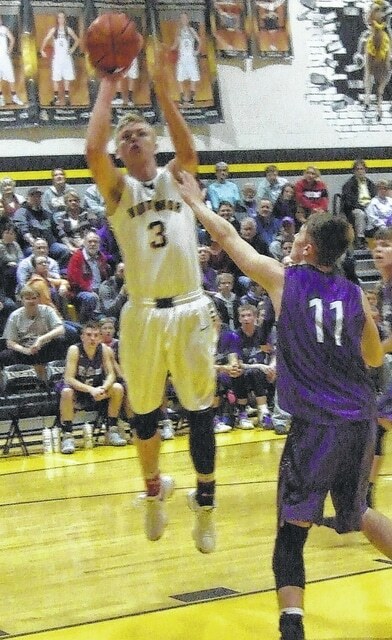 Mount Gilead’s Tyler Bland tallied 14 points in his team’s contest at Northmor. Alijah Keen tallied 10 points in the second quarter and 13 for the game on Monday. Jason Bolha drives to the basket for Mount Gilead.